When Mike Brock was a boat dealer, he learned that one of the main reasons people sold their boats was because they didn’t use them as much as they thought they would. For people living on the lake, the number one reason residents stop using their boat is because they have to either mess with traditional boat covers or clean their dirty boat because it was uncovered. Most boaters who live on the lake don’t want to go out for 4-5 hours on the water, but want to take short ski runs, catch a sunset, cruise down to the restaurant, or see if the fish are biting. If you are having to spend 30 minutes or an hour just to get on and off the water….guess what!…you eventually stop going out on the water. • Top Gun Fabric: Easy to clean marine grade fabric paired with UVA threading. Sealed with a polymeric coating which provides protection from outdoor exposure and abrasion resistance. 8 fabric color options or a camouflage design. • Marine Grade Frame: A unique frame design can be custom built around your boat, dock, boat lift, and boathouse. Aluminum framing is light weight and resilient for ocean, and brackish waters. Steel framing is strong and durable great for lake and river waters. • Cover Motor: Marine grade remote controlled. • Ventalization Mesh: Allows for significant air ventilation around the entire perimeter of your boat. This breathable feature ensures that your boat will completely dry and will help reduce mold and mildew. • Zipper: Easy release zipper for ease of install or uninstall, for seasonal storage. provides easy access to tighten zip ties. • Fiber Rods: Built into fabric for internal cover support. The rods allows the fabric to gather evenly when the cover rises and lowers. • Retraction Cables: Aircraft and marine grade stainless steel cables used to retract and fold up sides. • Brass Pullies: Die cast pulley with brass shaves. • Binding: Stylish acrylic binding around cover for protection and high end finish. • Riser: Customizable built in post used to support covers over boats in applications where no support is available. • Angle Bracket: Heavy duty adjustable bracket for large over hangs greater than 3 feet. • Gromment Holes: Customized drain hole placement per each cover allowing rain water to drain out. • Boot / Tower: Custom cavity built for coverage of towers, t-tops, and bimini tops. • Boat Lift Cables: Cover is custom designed to work with any boat lift. • Cable Holes: Openings are custom fit for cover to allow boat lift components to pass through cover. • Segmented Zipper Openings:Custom zipper openings that permit the cover to go around pilings, roof post or lift components. No more excuses! With the invention of the Touchless Automatic Boat Cover you can be on the water in just a few minutes and, with the simple push of a remote button, you can actually cover and uncover your boat while sitting in your recliner! Here are a few comments from the hundreds of satisfied customers. We have installed hundreds of these automatic covers in the last seven years and this is actually what people say about the Touchless Automatic Boat cover. It really is the greatest invention since the motorized boat. With the simple push of a remote control button your boat is covered and uncovered in seconds. No more straps or snaps. Full protection from sun and rain. No more fading or mildewing. Use and enjoy your boat so much more. Out-lasts other covers by years. (5-year warranty). 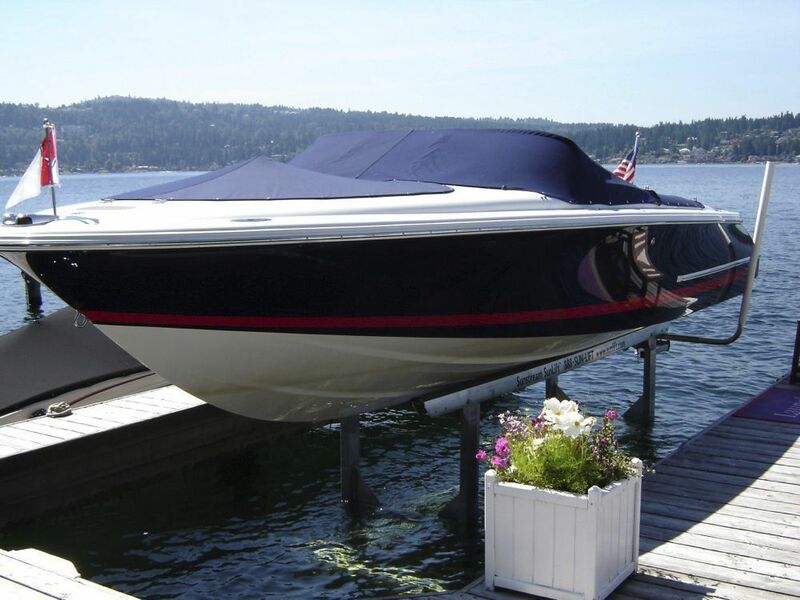 Hides and protects your boat, stereo, and accessories. Keeps your dock looking neat with much less spider or bird doo on your boat or cover. Ask about our winter discounts! For more information visit www.touchlesscover.com or call 512-715-2035. UNCOVER YOUR BOAT IN 30 SECONDS! boat detailing an gel-coat restoration. • Retain a substantially higher resale value. are unable to view your leisure investment.